With colima SimpleRoute, Lync administrators can adapt Lync routing simply, quickly and safely. SimpleRoute is now also available for Microsoft Lync 2013. Both SimpleRoute PRO and the free SimpleRoute FREE Edition are available for download on the colima website. Both versions are optimized for Lync 2013 and Windows Server 2012. New is that simpleRoute now works perfectly with snom phones. With colima SimpleRoute Lync administrators can quickly and easily customize the message routing of the Lync Server to the needs of the company and adhance desired functions. For example, both audio and video calls as well as instant messages depending on their origin, presence status of the recipient and content can be diverted or blocked. Thus no installation is necessary and there is no third-party software on the Lync Server. There is a "clean" interface and no third-party application can affect the operation of the Lync Server. SimpleRoute requires no programming skills. SimpleRoute provides reliable, script-based Lync routing. Dirk Klippert, Senior Systems Admin Information Technology of AGT International GmbH from Zurich explains: "We have had very good experiences with the product SimpleRoute, it is easy to use and we were able to start working with it very quick in comparison to other solutions, SimpleRoute is a convincing solution for Lync routing." 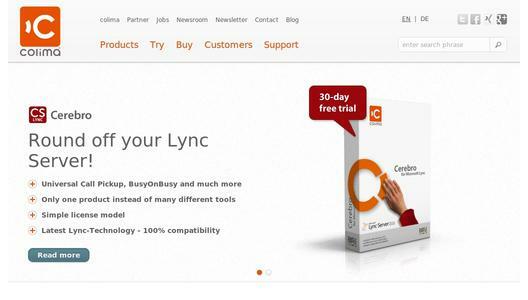 SimpleRoute is the colima entry level product for the optimization of Microsoft Lync. Requirements that go beyond the capabilities of MSPL scripts can be realized with colima Cerebro modules. For more information on colima SimpleRoute visit our colima website. colima communications is a german software company for simple and intuitive Unified Communications products. For nearly 15 years colima has inspired many prestigious clients across all industries with comprehensive solutions for automatic call distribution (ACD). High quality solutions for Microsoft Lync will be the focus of the future product range. Its clients include: Volkswagen AG, Michelin Tyre, Stiftung Warentest, IBM Business Services, Fresenius Netcare and many more. colima communications is represented at several locations in Germany and has its head office in Leipzig, Saxony. More about the company can be found here http://www.colima.de/en.